Students Shari and Tim Clover of San Rafael are born for the stage and love to sing duets together. As a performer, Monica enjoys concert work and has been featured at both the North Beach and Jack London Square Italian festivals as well as private fund-raisers. She has been seen at NTC as Christmas Past in an original Christmas Carol, the Countess in A Little Night Music, Amalia Balash in She Loves Me and as Gwendolyn Pigeon in The Odd Couple. 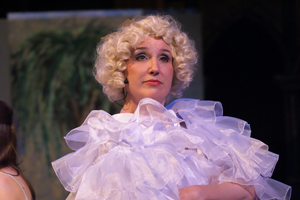 She also enjoyed playing the Fairy Godmother in Stapleton Theater’s Cinderella. As a youth music director and voice coach she has done more Annie’s than she can count, notably at Del Mar, Brookside and Marin Horizon schools; Alice: Tales of a Curious Girl and a musical Mother Courage at Tam High’s CTE, Hairspray and How to Succeed in Business at White Hill, Peter Pan at Del Mar, Bye, Bye Birdie and Mary Poppins at Brookside and Beauty and the Beast at Marin Horizon. Adult productions include Avenue Q, Forum, Pirates of Penzance, Fantasticks, Sound of Music and Most Happy Fella with NTC, among many others, and Children of Eden and Big at Stapleton. She was often seen on stage at the Altarena Theater in Alameda, and has music directed shows at Masquers and Contra Costa Musical Theater. I call myself a “therapeutic voice teacher” because I offer singers and speakers the opportunity to deeply explore all aspects of the voice, from the breath to making sound, in a way uncommon in traditional voice lessons for kids and adults. I weave together classic vocal techniques with body and energy-centered modalities, such as the Alexander Technique, yoga-inspired movement and Reiki. As an excellent vocal/body/energy diagnostician with deep knowledge of the vocal mechanism, I am able to quickly get to the root of a vocal problem or help someone grow vocally by addressing long-held physical and psychophysical habits that interfere with free and easy expression. My students are beginners and experienced singers young and old, actors, business people and broadcasters, folks from all walks of life who want to improve the quality of their voices, resolve vocal problems or work through stage fright. I also love to work with young people, helping them through the vocal transition, and the older vocalist to help him or her maintain singing and speaking strength and flexibility. It’s not unusual for a student to start a lesson lying on a massage table observing the breath, vocalizing in a yoga asana or toning. Not only is it fun, but it also teaches us how to make sound from the totality of our beings. I serve families in many areas in California, specifically Marin County, San Francisco, and Sonoma County. To contact me about the benefits of my singing lessons for kids and adults, please click here. “I have had the professional and personal pleasure of performing with Monica Norcia in Marin musical productions. Now, some years later, my 12 year old grand-daughter, reaching for the experience of performing with a musical theatre company, began singing lessons with Monica on a weekly basis. “For many years post childhood, I was very reluctant to sing solo in pubic, even though people would say, “You have a nice voice.” The reason: a brutal dictator of a choral director from high school who made me feel ashamed of my less-than-perfect voice. But I’ve always had a song in my heart and great relationship with lullabies and babies. Finally, in my “mature years,” I decided enough with the shame and enlisted my dear friend and musical theater collaborator Monica Norcia for voice lessons. Monica’s brightness, cheer and encouragement made all the difference. She helped me understand my voice as a physical instrument, what it can do and how I can use my whole body to support my singing. Terrified but determined I tackled my first recital and lo and behold, I lived through it and found my public voice once again. Second year recital: I faltered but carried on and found out how to stumble, fall and get back up again. Third year: I somehow landed the role of Golde in “Fiddler on the Roof.” This experience was one of the highlights of my adult life. “Words cannot express how grateful I am to have Monica as a voice teacher. In addition to dramatically improving my vocal technique, she has provided me with tools to reduce performance anxiety. Monica is very intuitive and approaches music and teaching holistically. She addresses the physical, psychological and emotional aspects of singing and performance. She customizes every lesson to work on issues as they arise. I have really benefitted from the Alexander Technique and have applied it to improve my singing, guitar playing, and bass playing. “Monica Norcia has been my voice teacher, voice coach and musical theater director for over 13 years. She has guided me through all of the musical theater and opera auditions as well has helping me with interpretation of the many characters I have played. “I have been taking voice lessons from Monica for a number of years. Her training has improved both the ease and quality of my singing voice immensely. “Monica is a talented artist and an amazing educator, I have found It is rare to find these two things simultaneously. She makes the students feel completely at ease in their voices and understands how to help them through emotional and technical stumbling blocks. “Working with Monica is truly delightful. She has been involved with a variety of plays at CTE/TAM Drama that utilized music and singing. By necessity, she works with students at all levels of experience and skill. At all times, she is professional, capable and creative in her work in a variety of music styles. “My daughter loves learning from you—and feels so lucky to have you as her mentor. She is thrilled with your knowledge of musical theater and your great audition song ideas and tells me how pleased she is to be learning technique from you. -Photo by Christina Blomberg/Stapleton Theater Co.